So here goes, I had a super time at our Annual Aromatherapy conference organised by the IFA, held in a leafy enclave in West London. It was lovely to catch up with familiar faces and fellow Aroma-nuts! We also had an inspiring programme of speakers, first up was a foray into the wondrous, exotic Frankincense. The enthusiastic Shehbaz Khan, imports the most amazing variety of Frankincense resins and some Frankincense essential oils. A lightening speed journey through the various grades, their colours and uses was enough to have us all reaching for our purses. The finest resin is Boswellia sacra, from Oman (I have some of this resin), of which there are various grades and the second most popular is Boswellia carterii (I regularly use this essential oil in both Aromatherapy and Perfumery). We were also introduced to Royal Green Hougari (or Houjari) Frankincense. It is rather expensive, but I was lucky enough to purchase some samples last year and have kept them locked up since - waiting for an opportunity to put it in an incense blend! It is limited in supply and frequently sells out. We then had a more esoteric talk from Alan Howell on the energetics of Essential oils, drawing on Taoism and Traditional Chinese Medicine, fascinating stuff and useful for many practitioners among us. Delivering a clinical aspect, we also had a talk from Ulla Maija Grace on the chemistry of essential oils. A table comparing Lavenders from about 7 different countries (including Iran and Japan!) was explored and we saw an eye-opening difference in their chemistry, especially in ratios of Linalool, linalyl acetate and 1.8 cineole. Unfortunately, the visuals were difficult to make out in detail at a distance, all the slides were packed with information! This confirms my inclination of sourcing my Lavenders from different countries (such as France, Bulgaria and New Zealand), depending on what I need, whether its for aroma, aesthetic aspect or specific chemistry ratios for therapeutic effect. There was also tempting stalls to make me spend, and so I did. I bought this Aroma USB gadget, by an innovative Japanese company called @aroma. Ironically, the product is designed in Japan, made in China and distributed in Europe by a German company! I have yet to use it, but think it will come in handy when I am using my laptop and want to create a 'mood-space' wherever I happen to be. USB stick from @aroma create your own laptop aroma! When you open the aroma gadget, you have the pad inside which you add the oils to and the heating element at the other end. There is a little button on the side of the unit so you can control the 'waft' of the aroma - how cool! Now I just need to create a couple of mixes, as it comes with 6 extra pads, so I can have different ones for various moods. I also purchased some new Cistus (ladaniferus) essential oil. It is pretty potent, dry, woody + warm; ideal for including in some christmas concoctions! The following day I attended a talk at the Kings Place in York Way, as part of the London Literary Festival. The horticultural historian and fiction-writer Jennifer Potter was presenting a talk based on her new book, 'The Seven Flowers that Changed the World'. Absolutely fascinating and lush, providing a glimpse into the rarified world of plant hunting, botanical history and symbolism. Our floral trail took in the Orchid, Poppy, Lotus, Rose, Sunflower, Lily and Tulip - sumptuous! Its a beautiful gem of a book, which makes a great partner to her other floral opus 'The Rose' a book of huge magnitude (in number of pages alone! ); which is on my shelf and I have yet to read, as I am doing my wrist exercises in order to have the requisite stamina to hold the book for long reading sessions! The glorious Sunflower -One of the seven flowers that changed the world! Inspired by my literary escape around the world, I returned home and revived myself with a Pineapple, Coriander and a Lime smoothie. I did resort to tinned pineapple (4 slices) with some of the juice, plus a small handful of fresh chopped coriander, with a squeeze of half a lime and 2 ice cubes. WOW! It was amazing, a fine marriage of sweet/sour, tart and fresh and vitamin-rich, (unlike my next list of libations!) I might have to vary the ratios next time and blend it for longer (but my blender broke half way through - 12 years a faithful friend to soups, smoothies and chopping stuff - RIP). This segues nicely onto my sampling of London Cocktail Week, which ran from 7th -13th October. I headed off to the RHS Harvest Festival at Vincent Square, where there was a cornucopia of produce from growers: giant leeks, gargantuan pumpkins, crazy-size carrots, and monolithic citrus. RHS Harvest Festival, London Abundant vegetable medley!! There was live music, food stalls, hay bales for sitting on and fake fires, all made the more convivial by the presence of The Midnight Apothecary, with Lottie Muir and her team handing out delectable cocktails such as 'The Bee's Knees'. This was a delicious blend of Jensen Old Tom Bermondsey Gin, Thyme-kissed with Pear infused honey and lemon juice garnished with a lemon twist. 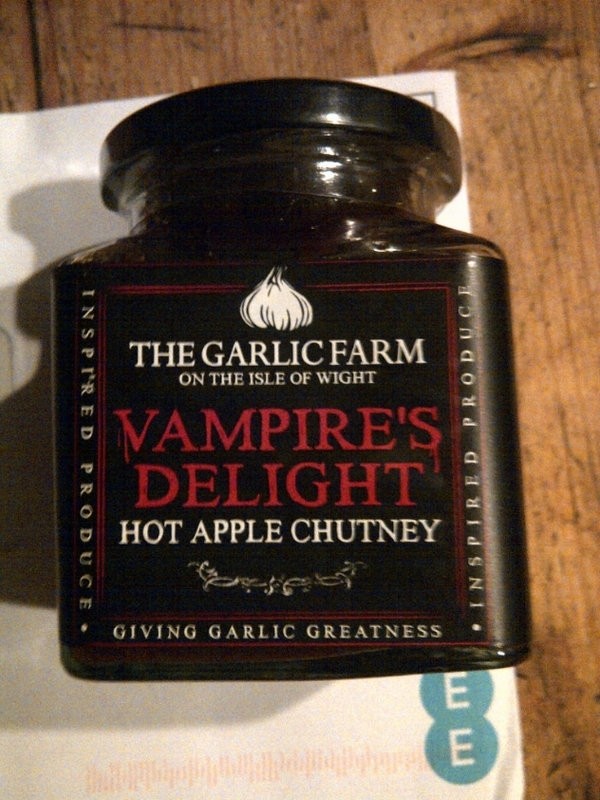 I then checked out some condiments on The Garlic Farm table and purchased Vampire's Delight, a 'hot apple + garlic' chutney and a Smoked Garlic, Chilli and Shrimp infused oil - pungent and begging for some dishes to test my culinary skill! There were also trays of the most amazing, aromatic smoked garlic, which was sweet, tobacco-hay like - even Dracula himself would sacrifice his mortality to scarf this lot! I think they also have a stall at Borough Market - see you there!! Thus sated by smells, tastes and sights, me and my cohort headed off to a little hotel bar in Victoria to round the evening off with an Aperol Spritz. Aperol is said to have "a lightly herbaceous and pleasant bittersweet orange flavour". Hmm, a few sips in, reminds me of Campari (which is due a revival!!) and it was a little similar to a Negroni. Aperol has developed a kind of cool reputation and over the past 18 months, (which somehow passed me by), but it does lend itself to alfresco soirees on a hot, sunny day <sigh, Summer seems a distant memory>. 1 Add lots of ice to a large white wine glass. Pour over the Aperol, followed by the Prosecco and gin (if using). 2 Stir once and finish the drink with a splash of soda water and a slice of orange. My stamina saw me through to the end of the week on Friday 11th, when a fellow cocktail-lover and I headed off to Central + Co who had a 'Treasure Island' themed cocktail evening, unsurprisingly based on Rum (yo ho ho). In the interests of research (naturally), a selection of the following were imbibed - very easily, I might add and as smooth as a pirate's cutlass! Then a 'Liveseys Poison' - the skilled Mixologist poo-poohed Mojito's and said this would knock it out the water. An expert blend of sweet, sour + smooth. Only Rum, Lime + sugar mixed – who could imagine such a simple trio could be so exquisite, complex and tantalizing. Our favourite. To finish (us) off a Buccaneers Old Fashioned – Rum, bitters, sugar + orange twist. Me love, love 'orange twists', like a hint of Grand Marnier. So, that was my week. I am off to replenish my energy reserves and open some parcels, I received a delivery of oils: Monarda Bee Balm, Davana and Pine Needle absolute. Oooh, but that's for another post! Older PostStrawberries and Mint - is it Pimm's o'clock?